The International Panel on Climate Change has postulated that, if left unchecked, we will likely see a 3.7 to 4.8°C increase in the Earth’s surface temperature by the end of the century. This temperature increase is likely to result in very disruptive and expensive events, such as rising sea-levels and extreme storms. Growing more trees, capturing CO2 and finding alternative, renewable sources of energy are all ways to help mitigate this temperature rise. Although automobiles and other light transport vehicles have the potential to be powered by electricity derived from renewable sources such as wind and solar, some types of transport, such as long distance trucking, maritime and airplanes will need a more energy-dense biofuel. 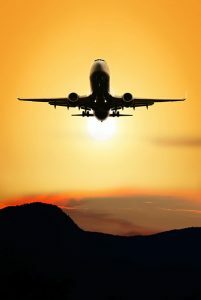 Traditional biofuels such as ethanol and biodiesel cannot be used to power airplanes due to their low energy density and their tendency to freeze at low temperatures (-30°C or lower). In the short term, most commercial biojet fuels will likely come from oleochemical feedstocks, such as tallow, used cooking and palm oils. However, in the mid-to-long term, cellulosic feedstocks will likely supersede these lipids/fats as the main source of biojet fuel because they are not in direct competition with food, are in large supply, and will likely be less expensive. The Forest Products Biotechnology/Bioenergy (FPB/B) group at UBC has been fortunate to receive support from companies such as Boeing, Bombardier, Air Canada, West Jet and NORAM and from the funding agencies Green Aviation Research and Development Network, NSERC, International Energy Agency (IEA) and BiofuelNet to assess the potential of producing biojet fuel from forest residues. Working with NORAM, the FPB/B group is coordinating the efforts of a number of companies, researchers and partners to determine whether a biojet production facility could be commercialized in British Columbia using local forest residues. Dr Susan van Dyk, coordinator for the project, is researching technologies and policies that will be required to get biojet fuels into the marketplace. As fossil-derived jet fuel is likely to be much cheaper to produce for quite some time into the future, effective policies will be required for all aspects of biojet fuel development, from encouraging production of feedstocks through to the production and use of the biojet fuel itself. Two graduate students, Anna Ringsred and Fraser Larock, are also working on this project. Anna Ringsred has been looking at the overall lifecycle analysis benefits of making and using biojet fuel, while Fraser has been assessing the adaptability of certification schemes to ensure the sustainability of the forest biomass feedstock. Anna Ringsred, originally from the USA and a former member of the USA Olympic speed skating team (Sochi), has a BSc in Chemical Engineering from the University of Calgary. Her previous experience in the biofuel and energy industry attracted her to the FPB/B group and this project in particular. Anna has been looking into the greenhouse gas (GHG) reduction potential of the various technologies considered by the project. Anna’s main research objectives are to determine which technologies and feedstocks offer the greatest GHG reductions and the GHG emission potential of a possible BC based commercial biojet facility. In order to do this, Anna will be using Lifecycle Analysis (LCA) – a methodology used in many sectors to assess emissions and environmental impacts of a product or service. LCA models calculate the emissions generated over the entire lifecycle of a product, from feedstock cultivation through production and final use of the product. LCA is commonly used by many of the worlds industries, such as the ATHENA model used by the building industry. However, when it comes to biofuel legislation, such as the Renewable Fuel Standard in the USA or the Low Carbon Renewable Fuel Standard in British Columbia, lifecycle analysis is primarily employed by the government to determine the contribution that a potential biofuel has to reduce emissions and help the province reach its GHG reduction targets. Though it depends on many parameters, Anna’s work has found that biojet fuel made from sawmill residues has significant potential to reduce GHG emissions. Forest trimmings that are generally left on site to decompose or burn also show significant potential, especially in fire-prone areas. The GHG emissions from biojet fuel produced from these pathways are substantially lower than petroleum fuel, reducing emissions by up to 85%. This is much more than current biofuels such as corn ethanol, which generally only reduce automobile emissions by around 35%. However, it should be noted that emission values are very location dependent, as they incorporate the regions’ cultivation practices, soil type, and electricity mix. Thus, it will be important to determine whether these same emission reductions can be expected for a facility utilizing BC feedstock. Fraser Larock, another FPB/B group graduate student, is working on the ATM/IEA biojet project. After graduating with his Forestry Operations degree from UBC, Fraser is using his forestry experience to help decarbonize the aviation sector by assessing whether current third-party forest certification practices can be adapted to help ensure the sustainability of the bioenergy and biofuels industries. Many of the Scandinavian and Canadian forest based companies, including lumber and pulp and paper companies, use third-party certifications to verify sustainability of their forest management practices. Groups such as the Forest Stewardship Council, Canadian Standards Association and the Sustainable Forestry Initiative have arisen because buyers of forest products (Staples, Rona, newspapers, etc) can assure their customers that their products have been sustainably sourced and produced. In much the same way that auditing companies, such as PriceWaterHouseCoopers, ensure the financial sustainability of companies, third-party certification groups ensure the sustainability of forest-based businesses. However, most of today’s current certification schemes do not consider the potential benefit of utilizing some of the forest residues currently left to decompose or burn. This sustainably produced biomass can be used to produce biochemicals, biomaterial and biofuels such as biojet fuel. Thus, one aspect of Fraser’s research is assessing how current sustainable forest certification schemes might be adapted to include forest residues as a possible feedstock for future bioproducts such as biojet-fuel. Other groups, such as the Sustainable Biomass Partnership and the Roundtable on Sustainable Biomaterials, are also trying to ensure the sustainability of their products in the bioenergy area. BC is a major exporter of pellets (mostly sawmill residue) and the global wood pellet demand rose to approximately ~25 MT per year in 2014. European power companies such as Drax are expected to continue to drive the demand for increasing the amount of sustainably derived biomass to fuel their power stations. Fraser’s work will consider the potential of modifying or adapting the certification schemes already in BC’s forests and assessing the economic and logistical challenges of using the considerable amount of forest residues available in BC. Rather than it being a flight-of-fancy, the biomass-to-biojet project offers one way of decarbonizing the aviation sector. For more information, please contact Anna Ringsred (anna.ringsred@ubc.ca), Fraser Larock (fraserlarock@gmail.com), Susan van Dyk (svandyk100@gmail.com) or Jack Saddler (jack.saddler@ubc.ca).